1. Place a hot dog in the middle of a cheese slice. 2. 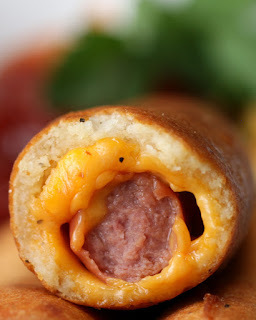 Roll the cheese slice around the hot dog, then push a wooden skewer inside. 3. Place the cheese-wrapped hot dogs seam side down on a baking sheet. Freeze for 20 minutes. 4. In a large bowl, combine the flour, salt, pepper, baking powder, milk, and eggs, stirring until the batter is smooth and has no lumps. 5. Pour the batter into a tall glass cup for easier dipping. 6. Heat oil in a pot over medium-high heat until 375°F-400°F. 7. Take a frozen hot dog and dip it fully into the batter, lifting it out then rotating it to let excess batter drip off. 8. Using tongs, carefully place the battered dog into the hot oil, rotating it so that it fries evenly. Remove when golden brown, then pat with a paper towel to drain. 9. Serve with ketchup and mustard!